Published by Gospel Standard Trust Publications. 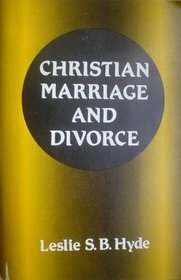 The emphasis in Christian Marriage and Divorce is on the authority of the Holy Bible. For too long people have put forward their own opinion or have attempted to fit Scripture in with their pre-conceived opinions. Considerable time is spent on the wedding service itself and the solemn vows that are made by both bridegroom and bride. Marriage is a most sacred bond compared to the union between Christ and His church. Careful examination is made of the texts which are usually urged in favour of divorce being allowed in the case of adultery. At the end of the booklet the question of divorced persons and church membership is firmly answered. We hope that Christian Marriage and Divorce will be used by God to cause young people to realise the solemnity of their wedding day and the vows that are then taken. It is most grieving to see a flippant, almost sniggering attitude at a wedding – the spirit of the world creeping in! We also hope that Mr. Hyde’s most helpful comments and advice to any who may have marriage difficulties will prove a blessing.